As I have earlier mentioned, it is quite apparent that either Tears for The Haramayn was more about fiction than fact or the author was ignorant about the matters of Hajj and its logistics. This is not to mention the chasm of ignorance in religious matters with which the article was littered. Often times people mistake oratory and good diction for knowledge and scholarship. Those who are taken in by the write-up find themselves making that mistake. Armchair critics are often critical of everything and everyone but themselves. They come across as knowing more than the rest of us combined. However, that projection is usually false, as you will discover. The charges are far from true. This is because all footages of the crane collapse were short and unclear. No one could reasonably use those videos as evidence of poor response time. On the contrary, we have the Twitter posts of pilgrims who were right within the Haram confirming that the evacuation of the dead and wounded was quick and order was restored quickly. This is despite the fact that what obtains is quite the opposite. In fact, in controlling human and vehicular traffic, we often see the measures the Saudi authorities put in place as too strict. For the most part, they curtail movements through an entry or exit point in more than one direction. This is to stop disorderly conduct. There is an array of crowd control barriers in bright colours everywhere in Saudia. To borrow from Hon. Patrick Obahiagbon, they are visible to the blind and audible to the deaf. The author did not marvel at the fact that no one has been crushed at the Ka’bah despite the multitude and the overzealousness of many worshippers who try to touch the Black Stone. It did not occur to him there is always a uniformed officer guiding people and guarding the Black Stone corner. The officer carries neither whip nor baton not to mention a gun. Warning lights stop people from gaining entry into the main courtyard of the Grand Mosque when it is filled to capacity. A green light signifies there is still space and specifies where there is space; either upstairs or on the ground floor. To enforce compliance, there are security personnel to turn erring pilgrims back at the entrances. This happens, to use the parlance, 24/7. Pray tell us what these measures demonstrate if not provision of logistics for round-the-clock regulation of human traffic. What do the chilled water fountains at every few hundred metres from which many quench their thirst represent? What is the purpose of the famous sabeel pilgrims get as gifts all the time? Why do their hospitals treat all pilgrims free and give free drugs? Do those measures count as showing human sympathy and Islamic hospitality to the guests of Allah? The cranes he roundly condemned are part of an on-going expansion project to decongest the mosque and accommodate more pilgrims- in order words, to reduce the crowd and make things easier for the guests of Allah. People more exposed and more knowledgeable in these matters have given due credit for the outstanding work at the Haramayn; work, which has not stopped the worship in the mosques. While pilgrims made tawaaf, their engineers safely and unobtrusively installed the circular platform around the Ka’bah known as the Mataaf. They have done several expansions of the Mosque at huge costs without collecting a dime from Iran or any nation for that matter. You only need to watch the cleaning of the mosques round the clock; the disinfection and washing of the floor every few hours without disrupting the worshippers’ activities significantly, the seemingly superhuman crowd control by a few without the objects of coercion to do so. They just urge patience and forbearance. However, as the proverb goes, “In the eyes of one’s enemies, one’s horse is never tall”. All these evaded the notice of critics. In Tears for the Haramayn, the author wrote, “If they really cared about the lives of the pilgrims, they would have paid more attention to their safety and comfort. If they cared about the fate of the pilgrims, they would, for instance, have laid the foundations of fast and comfortable railway links to connect Jeddah to Mecca and Medina”. Any sane person who knows the Haram as it was and how it is presently can only pray for the initiators of the changes. Intriguingly, the writer is not aware of the Haramayn High Speed Rail project commissioned since 2009 by KSA, to link Madeenah, Makkah and Jeddah. 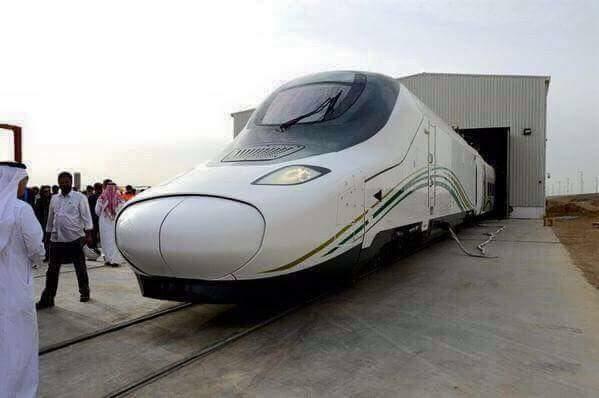 It is ‘planned to provide a safe and comfortable transport in 300 kilometres per hour (190 mph) electric trains.’ When completed in 2016, the railway will help ‘relieve traffic congestion,’ and serve about three million Hajj and Umrah passengers during the pilgrimages. KSA did not wait for the goading of bilious critics to start this project seven years ago. On whose graves did the Saudi authorities build? Islam forbids grave worship and its associated heresies. It is also forbidden to knowingly build any structure over a grave. The buildings currently around the Haram have been marked for demolition. They shall give way by the 25th year of their existence to more expansions. Indeed the prices of the hotels around the Haram are steep but we must remember land is at a premium the closer you get to the Haram. There are cheap, pilgrims’ apartments, which less privileged pilgrims rent for the period of their stay. In fact, such buildings are the bread and butter of the State Pilgrims Welfare Boards. The only things you sacrifice are proximity and comfort. Before the two incidents this year, the last time a crowd crush incident occurred in Minaa was in 12th January 2006 when a busload of pilgrims overwhelmed the security personnel and caused a crowd crush. Before then, there was and incidence in 2004, 2003 (the only succeeding years of a disaster), 2001, 1998, 1994 and 1990. There were fires in Minaa in 1975, 1997 and 2011. The last was a train coach fire that claimed a couple. The fire of 1975 was a gas cylinder explosion while the 1997 fire was a tent fire. Tents have been made from fireproof materials since then. The last decade would refer to 2005 to 2015. Only three cases happened in that time and two of the three were in the same year (2015). The aim is not to trivialise the incidents and the lives lost during them but to exaggerate them for whatever reasons is equally bad. I do not think that anyone who knew how the Jamaraat area used to be would accuse the Saudi government honestly or fairly of being reluctant or uncaring. Every year presents new challenges. Among the most unruly pilgrims are those who come from Iran. During the 1987 hajj, they staged a riot. About 400 people died. In July 1989, a bomb went off at the Haram. 16 Shiites from Kuwait were executed in connection with the incidence. In 2009, they desecrated the grave of Fatimah, the daughter of the Prophet (PBUH), in Al Baqee in Madeenah, forcing their way into the graveyard and claiming to have located the grave of our mother, ‘Aishah. They stamped on the grave and cursed its occupant and calling the dead names too filthy to print or recount. Maashaa Allah! I am beginning to be relieved from the ignorant, deceptive and selfish views of those Shiites "WASTING FOR THE WEST"! Jazaakallaahu khairan sir. Give us more.